It seems like an awful long time since I posted, and lots of things have happened! We had Dissolution, and the election, and then a very strange and extremely busy post-election period. Summer has wondered, repeatedly, whether to arrive. Yesterday morning was absolutely beautiful; last weekend was really cold and miserable; and today can't work out what it wants to do, but Test Match Special is on the radio, cricket is happening and it's pretty exciting this afternoon as England demolishes Bangladesh's batsmen (could do with less Geoffrey Boycott and more everyone else, but you can't have everything - at least Blowers, Aggers and Tuffers are all on...) I've potted up my chili seedlings today and put them in the greenhouse as hostages to fortune, so I can get rid of the heated propagator I've been falling over in the kitchen for the last couple of months. Knitting has been done. 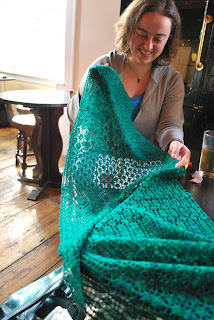 The main project I worked on between then and now was a wedding blanket for Katie and Neil, assembling squares produced by members of the Archers board on Ravely, from all over the UK and from Canada - Katie blogs about it here and it's great to know she loved it. I now have absolutely no fear of picking up stitches from edges, having picked up 24 from each edge of each square! It was lovely seeing everyone's squares and good wishes, and people were wickedly inventive with the Archers-themed blocks. I also knitted a shawl (as yet unblocked) and a cardigan (can't decide whether I like it or not now it's finished!) which I'll blog another time. 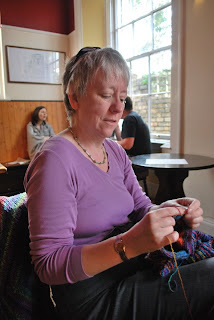 Not much progress on the spinning, but thanks very much to Isabella for her comment on my April 12 post, which has narrowly averted disaster; in future I'll either dye the fleece or the finished yarn rather than trying to dye singles before plying. I really need to sit down and read the spinning book I bought last year to get these technical details right! A belated happy birthday to you! 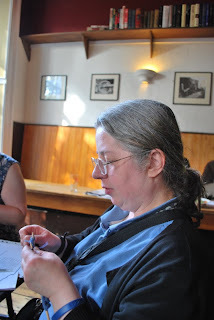 I enjoyed the photos of your knitting friends. Which pub were you in? 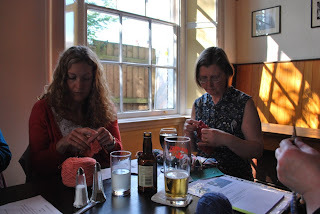 I lived in Rampton for many years, but I think I never managed to get round many Cambridge pubs. That sounds exactly like most photos of me: now you know why I hate having my photo taken so much. You have deleted it haven't you? If not, how much do you want? That much picking up stitches is truly heroic! And I haven't forgotten I want to do a blog post explaining what all the squares are!